Food chain owner Rami Levi did more than simply visit the Fogels in mourning – he stocked their shelves with food and vowed to continue to do so. 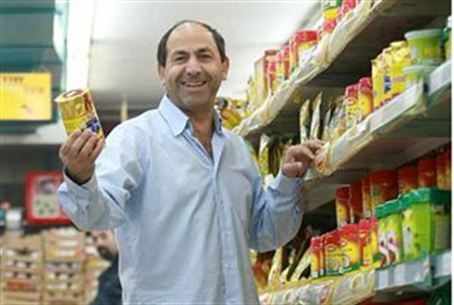 Rami Levi, the controlling owner of one of the country’s largest supermarket chains, not only joined thousands of others who visited the surviving members of the Fogel family to comfort them in mourning – he also stocked their shelves and refrigerator with food. The Arab terrorists who butchered to death Rabbi Udi Fogel, his wife Ruth and three of their six young children escaped the house without touching two other children, eight-year-old Ro”i and two-year-old Shai who apparently went unnoticed. The sixth child, 12-year-old Tamar, was not in the house at the time of the barbaric slaughter. She discovered the horror when she returned from a Bnei Akiva meeting more than an hour after the terrorists had fled. Levi recently became more widely known to Jews outside of Israel by helping prevent an Arab-American from buying out the financially troubled Nof Tzion building project in an eastern neighborhood of Jerusalem. He recently said that his purchase of the controlling interest in the investment company involved with the project prevents future trouble. “The project has 400 apartments, of which 100 are already built and occupied by 100 Jewish families,” Globes reported him as saying.” He explained that if an Arab were to buy out the project,” This would naturally create conflict between Jews and Arabs… This would have been a provocation. I prevented it."